6 Euros VAT included per shipment for orders to the Valencian Community. 7 Euros VAT included per shipment for orders with national destinations within the peninsula. No shipping costs will be charged for orders over 60 Euros. 17 Euros VAT included per shipment. No shipping costs will be charged for orders over 180 Euros. - For orders with payment by cash on delivery a charge of 3 Euros will be made but this extra cost will not be charged for orders exceeding 60 Euros. This method of payment is only for destinations within Spain. - We do not provide this service to the Canary Islands, Ceuta and Melilla, nor outside the EU (except for Italy, France and Germany, where we do deliver). 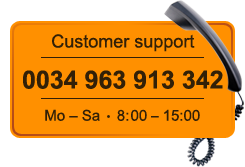 - We suggest that you provide an address and telephone number where you are present during working hours, in order to facilitate delivery by the carrier. In the case of the recipient being absent, the carrier will leave a notice and will arrange a second additional delivery at no cost. The expenses derived from subsequent deliveries will be borne by the customer. - The average delivery times are 2 to 4 business days for domestic shipments. - In case of noticeable damage to the package, you must record it on the delivery note itself, or inform the transport company itself within 24 hours. The user will have a period of 14 calendar days from the date of receipt of the product for the return of the same. You should contact our company in advance to coordinate the return shipment. Unless the return is made for defects in the product, the expenses related to the shipment will be borne by the customer. In any case the product must be returned in its original packaging and with its original seals.